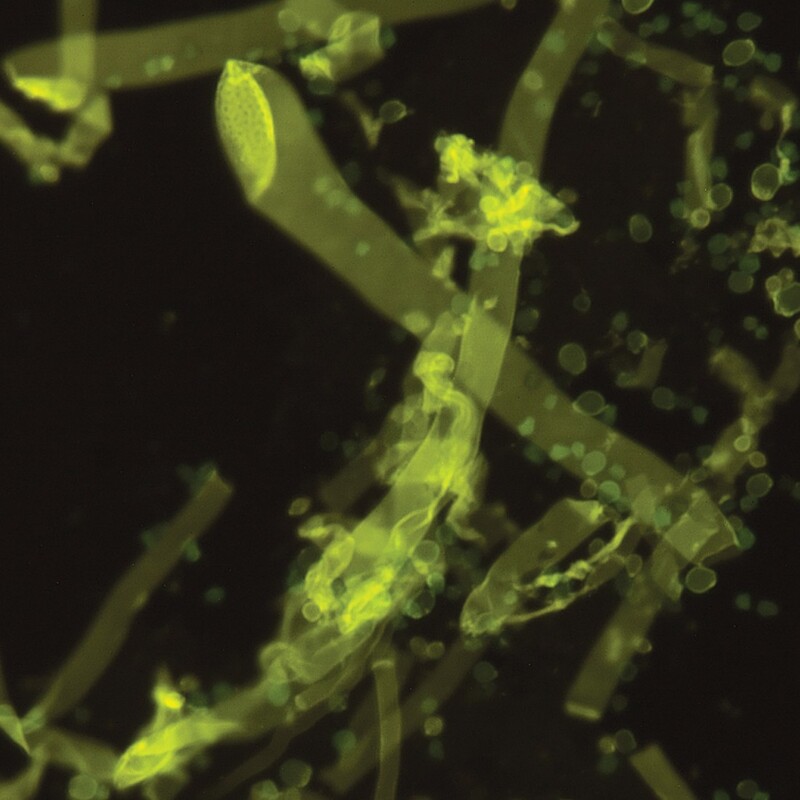 Fungi-Fluor kit | Polysciences, Inc.
Photo: Aspergillus culture stained with Fungi-Fluor®, no counterstain, 40X, FITC filter. Many opportunistic fungal infections develop in immunocompromised HIV-infected (AIDS) patients and also increasingly among the non-HIV infected immunosuppressed population. A number of these are caused by various fungal species including Candida, Aspergillus, Histoplasma, and Coccidioides. The Fungi-Fluor® Kit for Fungal Detection offers a quick fluorescent stain/counterstain procedure for various fungal organisms. The kit can be used to screen a variety of specimen types, such as sputum and skin scrapings, for fungal detection. Fungi-Fluor® Staining Solution is a 0.05% solution of high purity Cellufluor, an active ingredient of Calcofluor white fluorescent stain, in deionized water with potassium hydroxide added as a clearing agent. Fungi-Fluor® Counterstaining Solution B is an aqueous solution of Evans Blue dye, which is used to reduce background fluorescence. The Fungi-Fluor® Kit can be used for the rapid identification of various fungal infections in fresh or frozen clinical specimens, paraffin or glycol methacrylate embedded tissues. Typical specimens include sputum, bronchoalveolar lavage (BAL), bronchial wash and tissue biopsies. Kit contains: 75 ml each of Solution A and B.
Tomasiewicz, H., Johnson, B., Liu, X. & North, P. Development of Zebrafish (Danio rerio) as a natural model system for studying scoliosis. Journal of Orthopedic Surgery and Rehabilitation 1, 9–14 (2017). Harrington BJ, Hageage GJ Jr., (2003) Calcofluor White: A Review of its Uses and Applications in Clinical Mycology and Parasitology. Lab Medicine 34(5):361-367. Baselski VS, Robison MK, Pifer LW, Woods DR. (1990) Rapid detection of Pneumocystis carinii in bronchoalveolar lavage samples by using Cellufluor staining. J Clin Microbiol 28(2):393-394.